The deluge of documents from Posen, Prussia continued unabated this week. This is a good problem to have! I’m in the midst of trying to put all the bits and pieces together into a coherent story, but at this point there are several items that have only speculative placement in the family tree. I know enough to be certain that they relate to my family, but there are bits of information missing such that I can’t say for certain exactly how the information fits into the larger picture. What I’m doing at this point is putting the information into my tree where I suspect it belongs, along with a note about why I suspect it goes there and what information is needed to confirm or refute my suspicion. Before the undersigned registrar published today the known personage the midwife Auguste Brietkreutz née Breitkreutz resident of Stieglitz ____ religion, appeared and indicated that the Mietseinwohnerin [house-mate] Emilie Winkelmann née Marquardt, a widow for three years, evangelical religion, resident in the home of the kolonist [tenant farmer] Ferdinand Marquardt of Caroline [Posen, Prussia], gave birth in her residence on the 14th of August in the year one thousand eight hundred seventy eight at 9:00 pm to a male child who was given the name Otto Paul [Winkelmann]. So Emilie Marquardt Winkelmann gave birth to a son. Her husband [a Winkelmann] had died three years earlier. No mention of the father. She seems to have been living in the home of a relative, Ferdinand Marquardt, at the time of the birth, but is described as a “house-mate”. My friend and collaborator Jörg has informed me that the words used in the document “Mietsbewohnerin” and “Einliegerin”, mean that she was a renter with essentially what we call a “mother-in-law suite”. That is, an apartment within the house that has a separate entrance, allowing Emilie a degree of autonomy from Ferdinand’s household. Before the undersigned registrar published today the known personage the kolonist Ferdinand Marquardt, resident of Carolina [Posen, Prussia] indicated that Otto Winkelmann, age 1 year 17 days, evengelical religion, resident of Carolina, born in Carolina on the 14th of August 1878, son of the Mitbewohner [co-habitant or housemate] Emilie Winkelmann née Marquardt of Carolina, died in the home of his mother at 11:00 pm on the 1st of September in the year one thousand eight hundred seventy nine. Attested to by Ferdinand Marquardt who, being illiterate, has made his mark below. So there are a couple mysteries here. The first is obviously: who was Emilie’s husband and how was he related to the rest of my Winkelmann family that was living in Caroline? Secondly, how was Ferdinand Marquardt related to Emilie? One would suspect he was her relative, but she is not referred to as such, but rather as a “house-mate”. 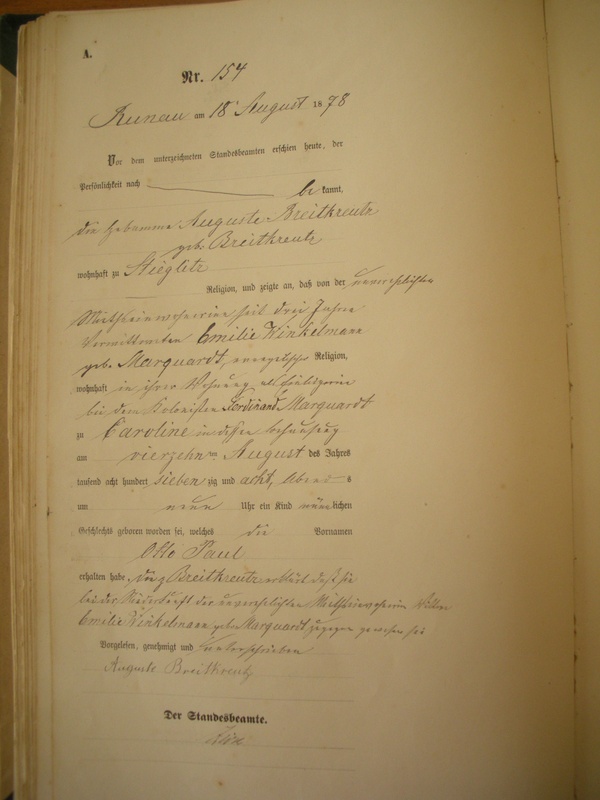 Marriage record for the protestant community in Schönlanke [Trzcianka]. Based on several pieces of circumstantial evidence, I believe that Emilie’s father-in-law Ludwig Winkelmann was the brother of my 4x great grandfather Christian Winkelmann, and so Emilie’s deceased husband Wilhelm Winkelmann would have been the first cousin of my 3x great-grandmother Wilhlemine Winkelmann. So Emilie had married Wilhelm Winkelmann in 1867 in Schönlanke, and he had died in 1875, three years before the birth of Otto Paul Winkelmann. Emily was living with a family member, Ferdinand Marquardt, who was not her father [perhaps a brother?]. He describes her as a “house mate”. No name of a father was given, and Emilie was unmarried at the time of the birth. Christian Julius Winkelmann was my 4x great-grandfather. I am in the process of filling in a great deal of details about his extended family thanks to a few very helpful and generous collaborators. Until then, I thought I’d post this document, which records his death in Carolina, Posen, Prussia. Christian was, apparently, a hired hand on the farm of Michael Zadow in whose home he died. Christian’s wife Charlotte Börke had died just the year before. The next summer an audit of district documents apparently turned up the fact that his place of birth and the names of his parents had not been recorded. A handwritten note about the information from subsequent hearings was added at that time. Unfortunately Michael Zadow did not know Christian’s parents. I believe they were Martin Winkelmann (a master tailor) and Eva Pontow, but that has not yet been confirmed. The Kolonist [farmer] Michael Zadow resident of Carolina reports, that the Leibgedinger [laborer] Christian Winkelmann, 78 years old, of evangelical religion, resident of Carolina, born in an unknown location, laborer for the reporting person, died on 14 Dec 1886, at 1 p.m., in the domicile of the reporting person [Michael Zadow]. 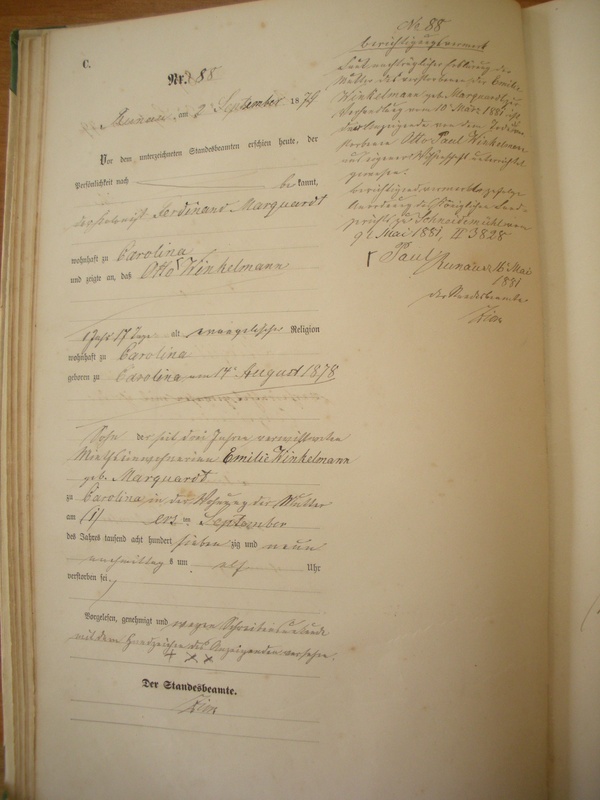 According to the subsequent declaration of the Kolonist Michael Zadow from Carolina concerning the hearing from July 7th and 22nd 1888, the deceased laborer Christian Winkelmann was born in Bergthal, Kreis Friedeberg, and was married to the deceased Charlotte née Börke. The names of the laborer Christian Winkelmann’s parents’, their rank, status and where they lived, is unknown. 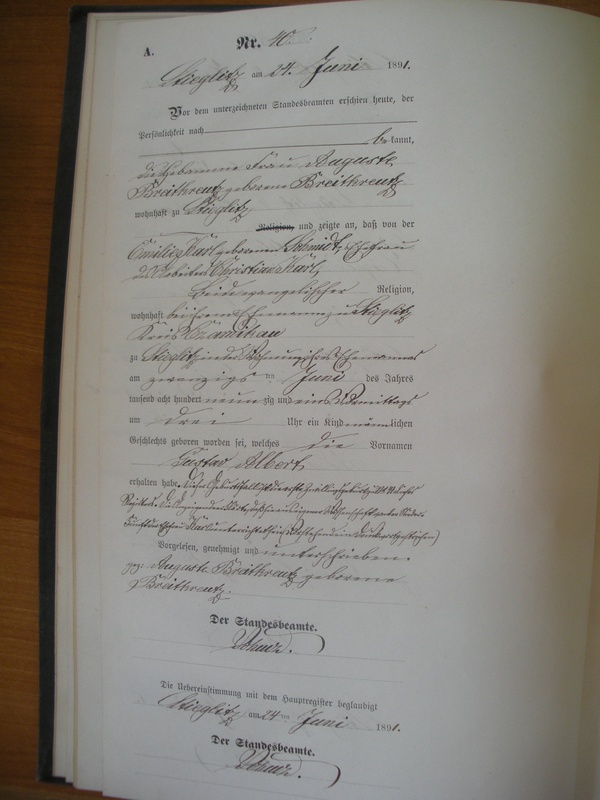 Correctively noted according to the the directive of the Royal district court in Schneidemühl, from August 1st, 1888, Steiglitz the 15th August 1888. 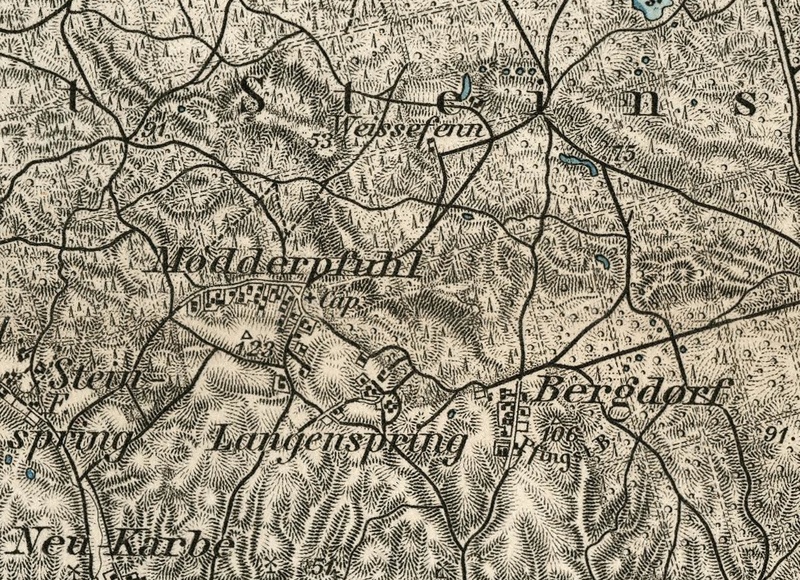 There is no “Bergthal” in Kreis Friedeberg, but there is a Bergdorf, which is very close to Modderpfuhl and Weissfenn, where we know these families were living. I think this is where he was born. Document courtesy of Marlena Krzemińska. With the help of several wonderful collaborators, we discovered recently that my grandfather Wilhelm Schmidt had an aunt named Friedericke Winkelmann who married a Wilhelm Prielipp in the town of Karolina in Posen, Prussia on 14 Feb 1864. The marriage record was sent to me last week by Lukasz Bielcki of the Poznan Project. We also know that that Wilhelm Prielipp and Friedericke had at least one child who was born in Gornitz in 1883 named Wilhelm Adolf Prielipp. I have Wilhelm Adolf’s birth record from Posen also, which was sent to me by Marlena Krzeminska, who lives in Pila. Last week I discovered that this same Wilhelm Prielipp went to America without his wife in August of 1864, only six months after his marriage. He left from Hamburg, Germany on August 13th aboard the “Harlequin” and arrived in New York on August 30th. It’s not known how long he stayed, or why he returned, but we do know he returned to Karolina, then moved to nearby Gornitz and fathered subsequent children in Posen with the same Friedericke Winkelmann, as I said. On the passenger list he is listed as “Landmann”, or farmer, the same trade listed in his marriage record. The ages and town of residence were also the same, so I’m pretty confident that it’s the same Wilhelm Prielipp. 1864 was rather early for Prussian immigration, at least to Wisconsin. The main wave of Prussian immigrants came between 1875 and 1890. The Zierke family (also from Posen) came to Harris, Wisconsin in 1865. The Kruegers came to Wausau from Pommern in 1882 and 1883, then Wilhelm Schmidt came from Posen to Harris in 1885 and his sisters and mother arrived in Wausau in 1892. Karolina and Gornitz were very small villages, and I imagine someone who had been to America would have been quite the subject of interest there. Wilhelm Prielipp went to the US, then came back. It seems certain he would have told the Schmidt and Winkelmann families about America. Perhaps that was the reason my grandfather Wilhelm Schmidt decided to go there in 1885? He would have been only two years old in 1864 when his Uncle left, so perhaps he grew up hearing the stories from his Uncle Wilhelm Prielipp about America? We’ve never known why our grandfather and his family decided to come to the US. This might be the reason. Years later, in 1922 and 1923, I believe another son of Wilhelm and Friedericke, named Hermann Prielipp, must have written to his first cousin Wilhelm Schmidt and asked for his help bringing his two boys to America. We know our grandfather paid for the ticket for Emil Prielipp to come to the US in 1923. I suspect he probably also paid for Emil’s brother Otto to come to the US in 1922. On the passenger lists for both Emil and Otto their father is listed as “Hermann Prielipp of Gornitz, Prussia”. That is the same town we know my Schmidt family lived between 1880 and 1892 prior to their immigration to the US. Emil and Otto settled on Grand Avenue in Rothschild near the Schmidt family. They got jobs as mechanics working in the “beater room” of the paper mill. The foreman of the beater room was my great-grandfather Edwin Schmidt. The children of the Prielipp family were friends with my cousins Gloria and Kay Johnson. At the time it must have seemed like a coincidence, but now with this additional information its true nature can be known. 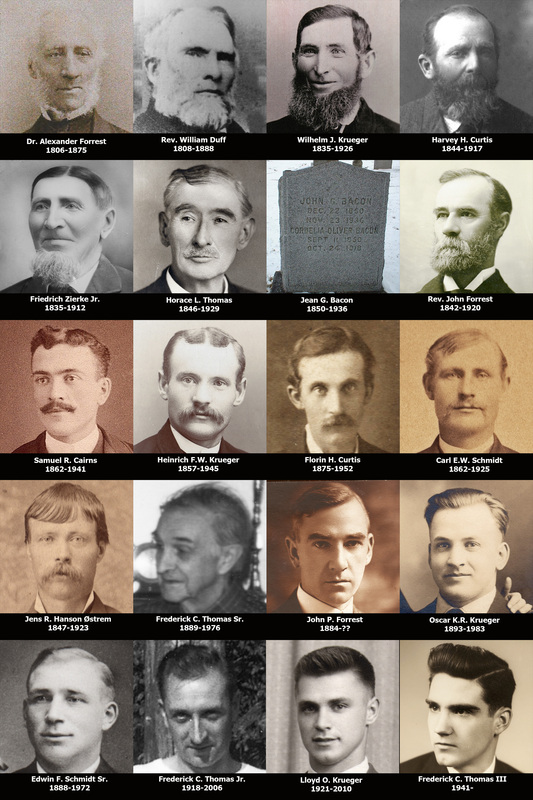 The seeds that would become that friendship were likely planted in 1864 half-way around the world! In the above article I describe how Emilie Schmidt married Christian Karl in Posen, Prussia and had twins [Gustav Albert and Wilhelm Friedrich] who were born on 20 Jun 1891. The next year in April, 1892, Emilie and Christian undertook the long and dangerous journey by steamship from Hamburg, Germany to New York when the twin boys were less than a year old. Gustav went with his parents aboard the steamship “Aller”, and his twin brother Wilhelm arrived in July with his grandmother Wilhelmine Winkelmann and his aunts Alvine and Bertha Schmidt aboard the “Ems”. Stieglitz the 24th June 1891. Emilie Karl née Schmidt, wife of the laborer Christian Karl, both of evangelical denomination, resident with him in Stieglitz, Czarnikau district, has given birth to a child in the domicile of her husband in Stieglitz on 20 June 1891, 3:00 a.m. named Gustav Albert. This case of birth is the second twin birth Nr. 40 ( first twin birth Nr. 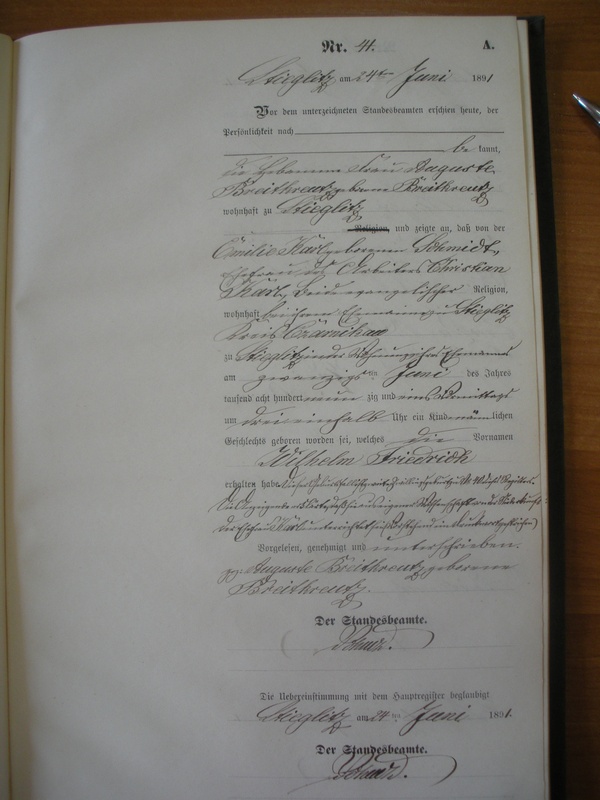 41 for Wilhelm Friedrich) of this register. The mentioned person declared that she can confirm the birth described above. 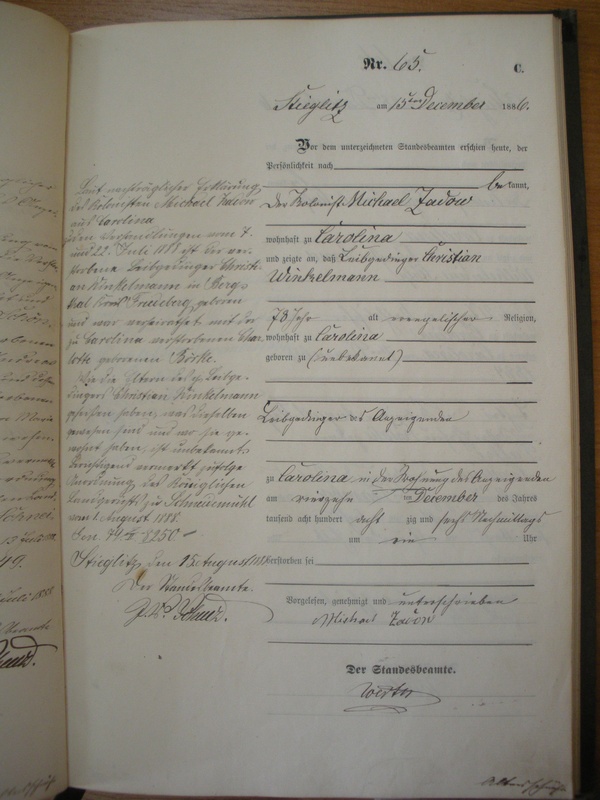 Attested by Auguste Breitkreutz née Breitkreutz, registered by Joherz? in Stieglitz on the 24th of June 1891. Joherz?. Emilie Karl née Schmidt, wife of the laborer Christian Karl, both of evangelical denomination, resident with him in Stieglitz, Czarnikau district, has given birth to a child in the domicile of her husband in Stieglitz on 20 June 1891, 3:30 a.m. named Wilhelm Friedrich. This case of birth is the second twin birth Nr. 41 ( first twin birth Nr. 40 for Gustav Albert) of this register. I’ve found probably a dozen or so books, perhaps more, that each deal with a certain branch of my family tree. These books are usually helpful, usually incomplete, and usually written in the late 1800’s by someone related to the family who was also a genealogist. They are dry, and written in a very matter-of-fact style, but I love them. They have their own unique charm. For example, here is one on the Pond family written in 1873 by Edward Doubleday Harris entitled “A Genealogical History of Daniel Pond and His Descendants” which chronicles the history of the family of my 3x great-grandmother Louisa Pond. 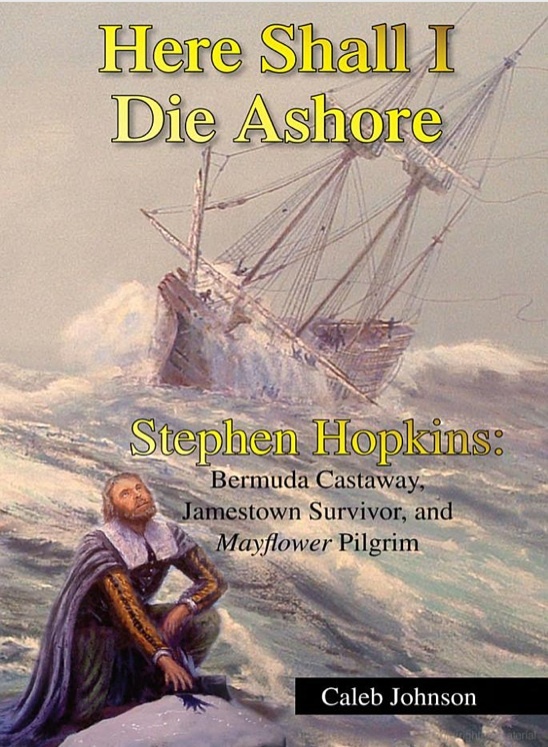 Last night, however, a helpful person on Ancestry pointed me to a book on my 12x great-grandfather Stephen Hopkins [ancestor of my great-great-grandmother Helen Maria Nason]. He, along with members of his family [including his daughter Constance Hopkins, my 11x great-grandmother], came to America in 1620 aboard the Mayflower and was one of the principle founders of the Plymouth Colony in Massachusetts. Stephen worked with Myles Standish and Squanto to keep the colony alive. But before that he was shipwrecked in Bermuda, visited the fledgling Virginia Colony [which predated the Pilgrims by a generation], and generally had a pretty incredible life. It’s really impressive. I aspire to his level of writing when it comes to making family history engaging and interesting to read.